SnapChat is an app which allows you to send messages to your connections that “self destruct” once they’ve been viewed. So in other words, it allows you to send messages that you only want to be viewed once. After they are viewed, they are automatically deleted. So the point of the app is to capture moments that you don’t want to live on forever. For this reason, I’ve concluded that SnapChat is a complete waste of time. If you’re of the sexting type, this is the app you’ve been waiting for. You can send all the nudes and compromising photos that you want and feel secure that they will be deleted once they’re viewed. Can’t the person receiving these messages take a screenshot and save it to their phone? Oh, yes they can. And by the way, according to a digital forensics examiner, your deleted snaps can still be retrieved from your device. But what if you’re just using it to send funny jokes to friends? That’s fine– no harm in that I guess. But what’s the point? When I share messages with my friends, family or digital audience I want them to mean something. I only have a limited amount of time on this earth and when I leave it, I want my place to have counted. Why would I waste time crafting messages, having experiences and social exchanges that are deleted once they’re viewed one time? The premise of SnapChat is to create messages that will disappear once the exchange has taken place. In my opinion it devalues our experiences to momentary anecdotes that disappear and are forgotten. Social media has revolutionized the way that we capture life. We can instantly share photos of our experiences with friends and family. We can craft interesting and engaging messages for our audiences and connect with new, interesting people. Why waste your time creating messages, exchanges and experiences that disappear? If you’re going to take time to craft a message, make it meaningful. Make it worth keeping forever. But by all means, if you’re a prolific sexter and want to make sure nobody sees the ridiculous and shady crap you’re doing, SnapChat is definitely for you. Have you tried SnapChat? Am I completely off base here? You can leave a comment by clicking here. I use SnapChat a bit. 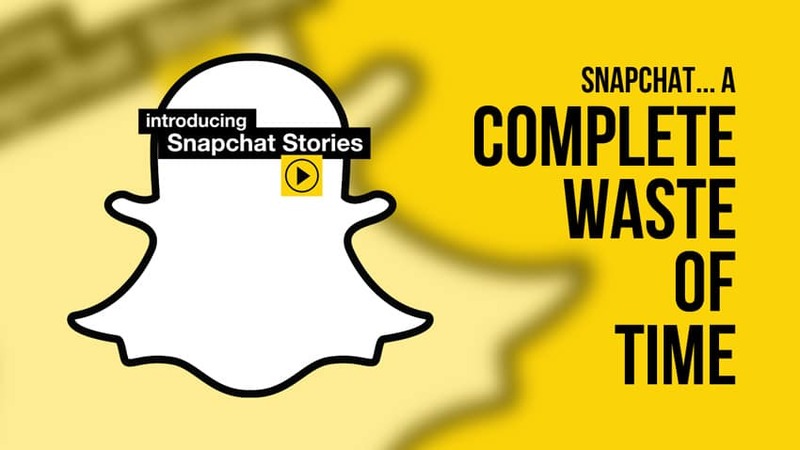 They have now introduced ‘SnapChat Stories’ which is essentially a group message to ALL your followers. These can be view unlimited times for up to 24hrs. It is much faster to send a picture/video than using MMS, or email. The quality of the photos/videos are poor, but that’s not the point, the point is to be QUICK. Instagram is now taking a stab at providing a quick way to send snaps to friends, dubbed Instagram Direct. I think this was Facebook’s knee-jerk reaction to SnapChat for rejecting their offer. Instagram’ Direct photo/video messages can be sent to specific people and they can group like/comment on them. They last forever, or until the sender chooses to delete it. But, it’s still much slower than SnapChat. You have to 1 open the app, 2 click camera, 3 take your photo, 4 select or skip the filters, 5 click direct message, 6 select your recipients & hit send…. As opposed to SnapChat: 1 open app, 2 take picture, 3 select recipients & send. What I’m trying to get at is that SnapChat’s appeal (afaik) is due to its speed and simplicity, and (somehow) it’s quickly growing userbase. Interesting. Thanks for the perspective, I really appreciate it! Dustin, I love your writing and I think you are great at it. You are looking at snapchat through a personal sense. It actually has huge potential for advertisements, sending a unique message and kind of a fun or different way of opening it. I would love it if I received a snapchat everytime your blog was updated with a new story. It’s like texting and easier than emails because it’s so simple. I don’t have to feel pressured to read the an email with several different stories. I am having problems writing my ideas out to you and not being very clear. Here’s a link to an HOA, Jessie (don’t know how to spell his last name completely) Woldyjo or something has a great HOA on it. Initially I shared the same thoughts with you but after watching it, I am much more optimistic about snapchat. I wish I had the link for you! Thanks Jake! I’m looking at it from a scalability standpoint as well. I didn’t go into that as much in this piece but there’s also a few things I don’t know about Snapchat. For one, is there a group messaging feature? Can you send a snap to all your connections at once? Because if not, this is a deal-breaker for businesses. No business or brand is going to add each individual to a message blast. Secondly, are links possible in a snap? Without the ability to send links, that eliminates a huge segment of businesses and brands (bloggers in particular) that rely on click-through for measuring return. Going by that logic – Facebook is the future of social media marketing. Agreed Andrew. Jesse did end up making some valid points, but still don’t merit that it’s better than Google+ (not by a looooong shot). I’m holding onto my ammo for now to see what happens. I love Google+, because people find my posts, about all topics, YEARS after I posted. That, to me, is priceless. It’s meaningful interaction that sticks around. Great article Dustin, if for the simple reason of yours being an opposing point of view in a space where a lot of people are raving about Snapchat. I just tested out setting up a login tonight and got bored by it within 3 mins. But, I was surprised to see so many people signed up on there who I know and wouldn’t even class as super early adopters on social – not active on Google+ etc. So that in itself was interesting, almost reminds me of the rush to sign up to Facebook by people I knew in the early days. The app I personally don’t get/like the look of yet – but I’m keeping an open mind, because you just can’t ignore the popularity and buzz. There’s something going on here, and it might be an younger age thing driving it, but there’s a mix on there and I’m curious to see how it plays out. The thing that I still can’t get my head around is knocking back the alleged $3 billion Facebook buyout offer – if that’s actually true, it’s got to be the most expensive bit of PR ever achieved. I’d have taken the cash…and gone bought me a beach somewhere! If my predictions are right, the founder will be kicking himself for not selling. what would you do with $3 billion Dustin? crazy money. And yes they will be kicking themselves one day – probably. Love to hear what their other half’s/families thought of them rejecting the cash! Honestly, I’d probably give most of it away. Haha– I’d love to hear their family’s perspective too! I have no use for this perverted kind of stuff,my plan and desire these days are to take every thought captive,to be seated in Heavenly Places and totally be consumed by Fathers Love.This is the reason I pray for #1) Swift Conviction,#2)The Words of Life that lead to Eternal Life #3) Clear Vision for The Lords Direction . Good way to be Robert. Snapchat is the Most Valuable Marketing Tool. Snapchat is the Best Marketing Tool Right Now. Why Do Teenagers Love Snapchat? Hey, Dustin! I have to admit that I didn’t get it at first, either. However, having a 17 year old little sister, I’ve come to realize that the younger generation doesn’t actually WANT to have everything they do recorded in internet history forever. That seems to be the appeal. I also read an interesting article (wish I could remember where) that points out – sexting aside – that the ephemeral nature of Snapchat allows people the freedom to be more themselves rather than putting up a public front. If you know that photo will be forever on the internet, you may present yourself differently than if that photo will (should) disappear within 10 seconds. Of course, there’s the screen capture function (which I think shouldn’t exist) and the still-stored data, but that’s not really something that the younger crowd is focusing on. My little sister sends me snaps with text almost predominantly over text messages. Often times, the photos are ridiculous and silly faces that I doubt she’d want floating around everywhere, but it has actually encouraged us to communicate back and forth more often, strangely. As far as biz/marketing goes, I’m curious to see how Gary V uses it, because he swears it’s the future. I can definitely see that Rob. And you know what, that’s totally cool. I really am curious about the Gary V thing– did he really say that?! Now, I’m a huge Gary V fan, and although he’s mostly spot-on with 99% of what he says, this just reminds me that he’s human afterall. Also the fact that in his new book he basically says Google+ isn’t a viable channel (I would love to step in the right with him on that one! lol). Share the crap out of my google+ post, tweet it, facebook it, and tag Gary in every way possible! lol Hopefully he doesn’t get annoyed, but intrigued. So in summary, I absolutely agree, Dustin. Thanks Anne! Can you post a link to any of those articles you’ve read? I’m simply befuddled that anyone could (credibly) write about such a thing. Never heard of it and not interested for the reasons you stated. Dustin, it’s when I come across articles like this that I’m reminded why we get along so darn well. Mind meld, man. Just the same wavelength. I’ve been using snapchat for only a few months, and I totally understand (and agree) where you’re coming from. But for me, I use it to keep up with friends who I would otherwise not see often. I still text them and what not, but snapchat lets us communicate on a different level. I’m not a total fan of it though. So why can’t you just use your phone’s regular messaging system? Or email? Or Facebook? Or Google+? Or Twitter? Or [insert one of the other hundreds of messaging apps out there]? That’s what I really don’t get about adults using it. I wonder if some of this comes down not so much to marketing as to age or even how long a person has been using the internet. I got over sending and accepting “funny videos” after a couple years on the internet which is well over 15 years ago. This includes racy, NSFW content some of my colleagues would send around via email! Yeah, idiots. They would have definitely loved SnapChat. As for me, I just don’t have time for nonsense and have enough noise to filter through without yet another time-waster. Something that matters now and in a year and in a decade definitely passes the “not noise” test and is content I am interested in and the channel that delivers it will also be one I prefer. Thanks for adding to the conversation Tim! I’ve got to say, I do use snapchat. Personally, me and my friends use it to send funny videos to each other. The delete functionality isn’t really the big draw for me, it’s the fact that it’s SO easy to fire off a funny picture or video to certain people that you want to see it. I don’t see myself using it forever, but for the one or two people I use it to keep in contact with, it’s great. So is it easier than using your normal messaging app on your phone? Hell yes! It’s much quicker for whipping together a quick video to send! The only reason I won’t use it forever is that, as with many of these things, it will probably be a phase. Well here’s to hoping this is a very quick phase indeed!